One of the most iconic archetypes, the Ulrta-Human is probably the most and least well known. We define the Ultra-Human as a paragons exceeding human expectations on multiple levels. There are a host of heroes that could meet this definition. 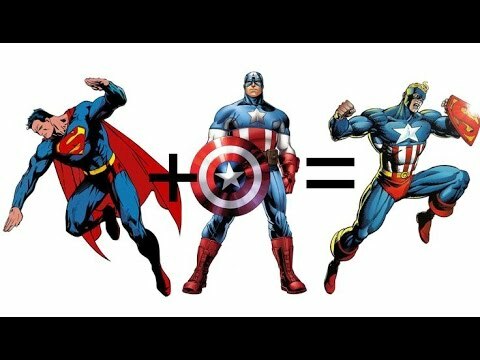 Just to name a few Justice Leaguers we have: Superman, Wonder Woman, Aquaman, even the Martian Manhunter can fall into this category. At the same time we can also point to things like Alien, or Mythic as just as fitting. At the same time, these heroes are all stronger, faster, and more durable than any normal human. The Ultra-Human is as much a starting place as it is a power unto itself. Unlike most of the Archetype articles, the basic Framework actually covers everything one might need. As we focus on their enhanced physicality, we will begin as a Support Power, providing additional bonus to represent their tougher nature. At their base level, the Ultra-Human is Stronger, Faster, and Tougher than a normal human. This makes them more capable in combat, becoming more difficult to harm and able to match a trained fighter with their speed and power. A quick note on Support for an Attributes or Talents. Powers that Support Attributes offer a Bonus on any non-combat rolls that use the attribute in question. This allows heroes to excel in a host of different areas. So why have a Power Support a Talent? When a Power Supports a Talent, it is treated as levels in the Talent for any associated Advantages. For Example: A power Supporting Wisdom would often grant a bonus to most Occult rolls. While a Power Supporting Occult would always grant a bonus to Occult rolls, and bonus damage to any Supernatural foes, the Advantage associated with the Talent. Overall the basic Framework allows the hero a number of advantages, in and out of battle. Due to their broad focus, the Ultra-Human can fill any role, if not as well as more specialized characters. To expand on the basic Framework, we will look at two common interpretations of the Ultra-Human, the Paragon, and the Warrior. Note: Another common variant layers in aspects of the Blaster, adding some form of ranged attack, be it energy bolts or eye beams. Because Blasters will be showing up later on our list, we have chosen to focus more on variations that emphasize the Ultra-Humans base abilities. The Paragon reinforces the gifts of the basic Framework. the Paragon’s fists are as dangerous as swords. They are tough enough to shrug off gunfire, even ignore massive attacks that would be lethal to anyone else, for a brief period of time. The Paragon can walk into the worst situations and come out mostly unscathed. All these advantages mask the Paragon’s weaknesses, last of true specialization. While tough, multiple types of attacks can ignore their defenses such as blades so sharp they cut through anything, or psychic blasts. Flight allows them to be virtually anywhere, but their lack of speed means they can’t be everywhere at once. It’s easy for Paragons to forget these facts and overestimate their abilities, biting off more than they can chew. Leveraging their natural gifts, the Warrior aims to enhance their abilities through martial training. This increases both their Offense and Defense. Additionally, the Warrior has learned a number of tricks that can shift the direction of a battle. Not nearly as durable as the Paragon, the Warrior is more elusive thanks to their training. This training also allows them to land powerful blows, almost on par with the Paragon. So, what sets them apart? The Warrior’s training is something that cannot be taken away from them. Attacks that reduce a hero’s Power can cripple a Paragon, while the Warrior is still capable of pushing through and taking on any foe thanks to their skill. The Ultra-Human is all about excelling above and beyond human limits. Their talents reflect this, increasing their general ability to perform any physical task, or rise above wounds that would cripple others. Vulnerability, and Power Loss, are perhaps the most common weakness for Ultra-Humans. Substances that cut through defenses or steal their powers. Perhaps the most versatile of any Archetype the Ultra-Human can be used for a basis for any sort of power . When designing Metahumans Rising, the concept of the Ultra-Human was one that kept coming up. When someone is simply better than everyone else, how do you allow each player time to shine. This is addressed two ways. The Ultra-Human is the ultimate generalist, their powers can be stunning and seem daunting. However, due to how powers are portrayed in Metahumans Rising, this doesn’t make them more capable in social situations, or challenges that focus on intellect over brawn. More so, in the midst of combat, the Ultra-Human lacks a number of more specialized Power Boons that allows other characters to stand out. For an example of the Ultra-Human in actual game play, take a look at our Three Rivers Academy podcast. Arianna is an example of an Ultra-Human in action.